This popped up in So Cal on C-list near me. 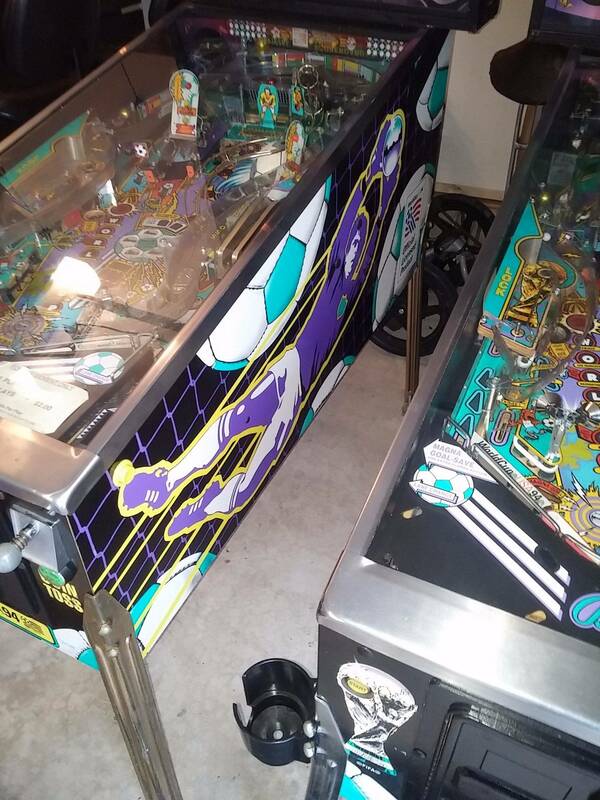 I just started collecting pins and my first game I bought was a WCS three weeks ago from a fellow pinsider. Well, the bug bit me and I have a shadow on the way and I couldn't resist buying this WCS because the price was right. I contacted the seller and negotiated a price. The person told me their grandfather bought it brand new for the grand kids and he remembers playing it since he was four years old. Eventually the grandfather gave it to him and it sat near his kitchen unplayed for quite some time. He did not have keys to unit. 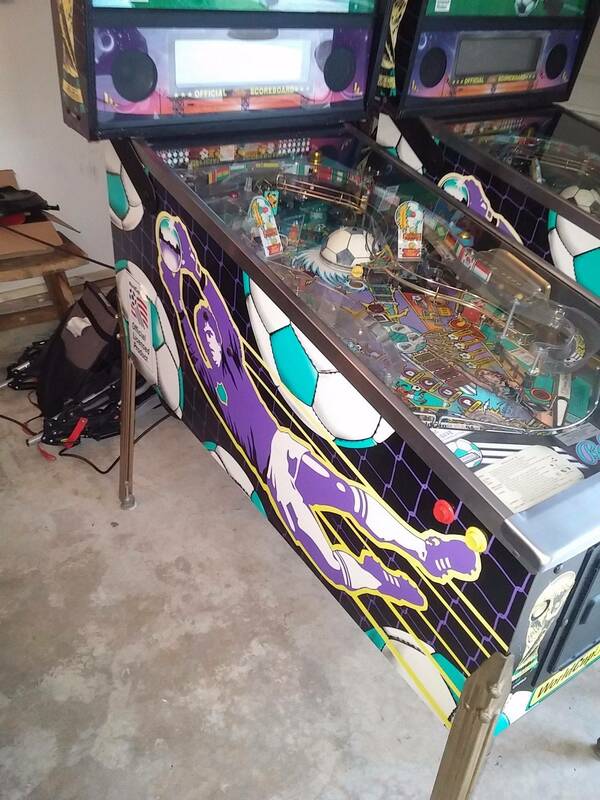 I arrived and tried to negotiate a better price by a couple hundred bucks because I was worried about potential battery damage and the condition of the playfield (wasn't sure if it was just dirty). He wouldn't budge so I took the risk. 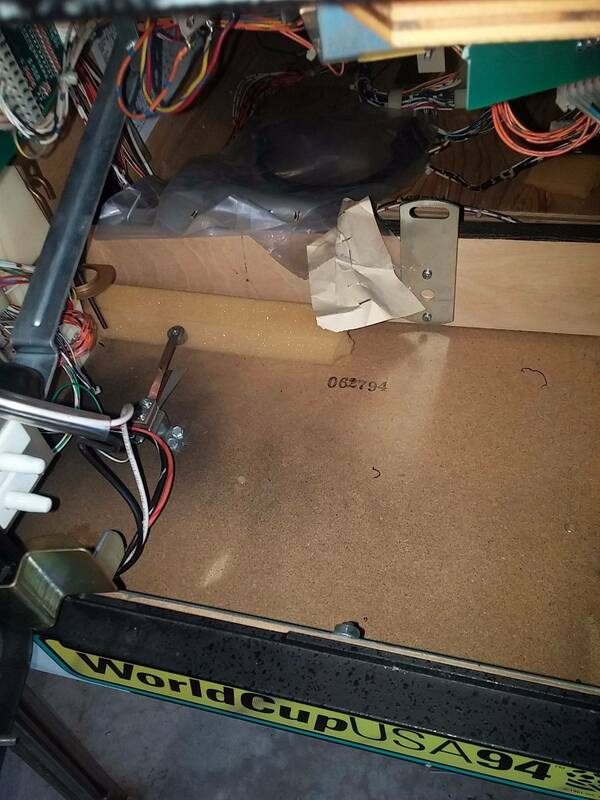 Based on the condition of the cabinet, plastics and kickouts you could tell there was minimal use. The DMD looked strong and it still kept the high scores. I got the machine home and tried the keys from my other WCS to see if it would open. 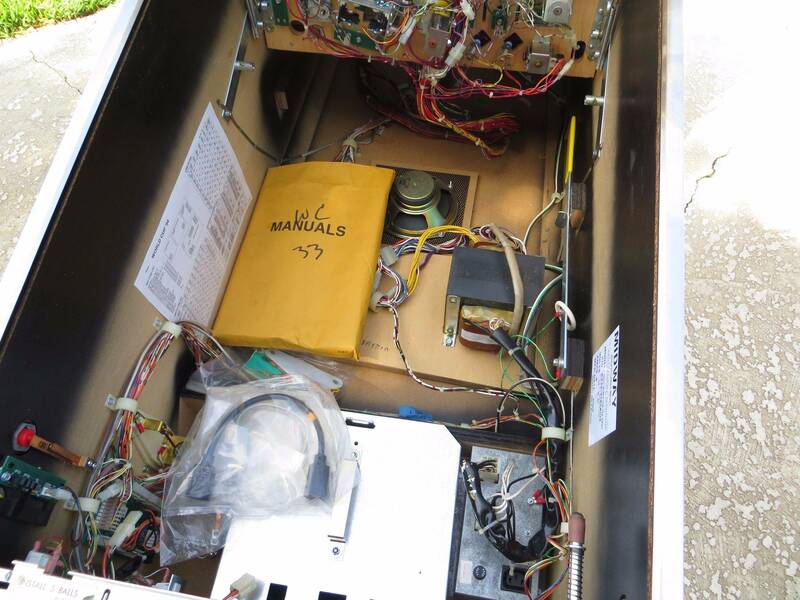 The coin box door opened with only inserting the key a portion of the way and turning. A screwdriver would have done the same thing. DUH, should have tried that at his house. Newb error. I was pleasantly surprised to find all the additional items shipped with the game still in the sealed bags. Also the keys for the back box. The plumb bob was never even installed. This game was truly untouched. I opened the back box and it looks mint, no battery rot. The batteries were dated 2007 and still worked! 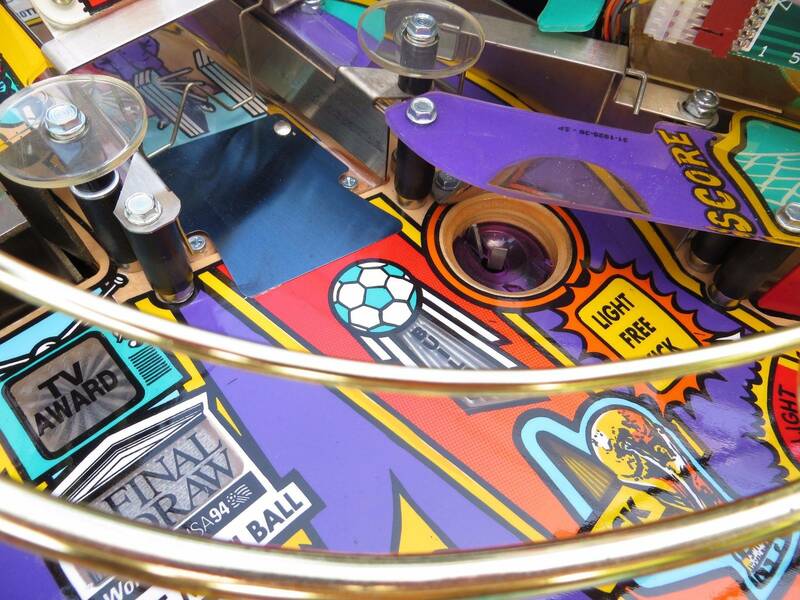 I applied some Mill wax to the playfield in one spot and it shines up beautifully. 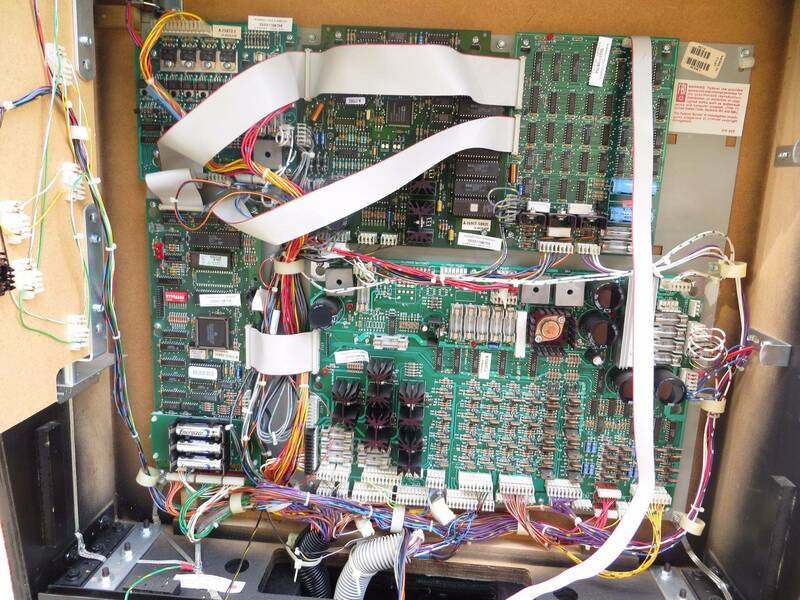 My plans are to keep this machine and sell my other WCS which is in great shape also. I just put cliffys and LEDs on my first machine and it plays perfectly. 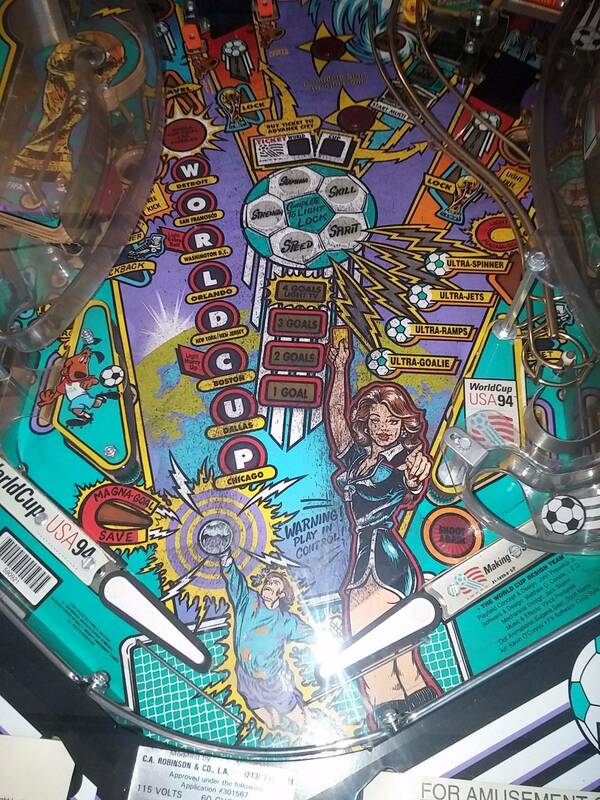 Being that the kickouts are in such good shape should I put Cliffys on the new machine? 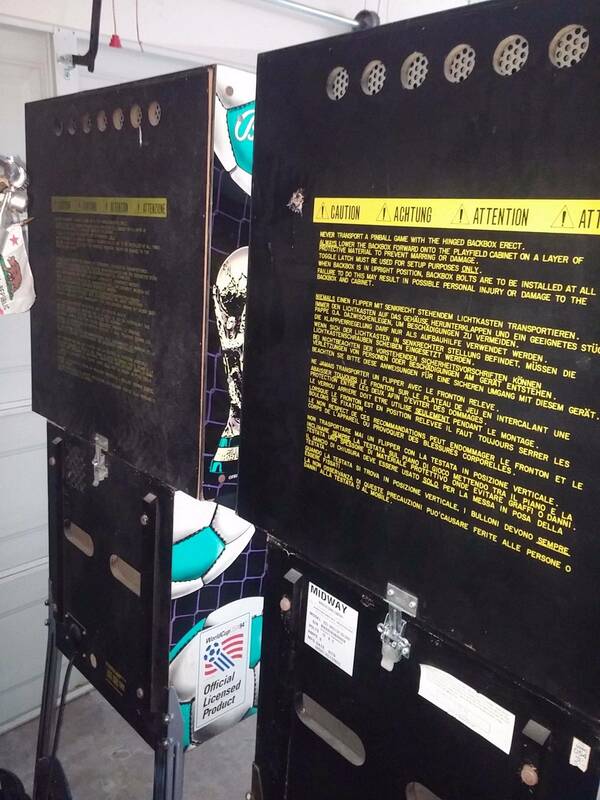 My plans are to fully strip down the playfield, change rubbers, New soccer ball, LEDs and possibly colored post rubbers. I know it is only a WCS but I thought it was cool to find one with all the sealed bags, etc. They game really is near mint. 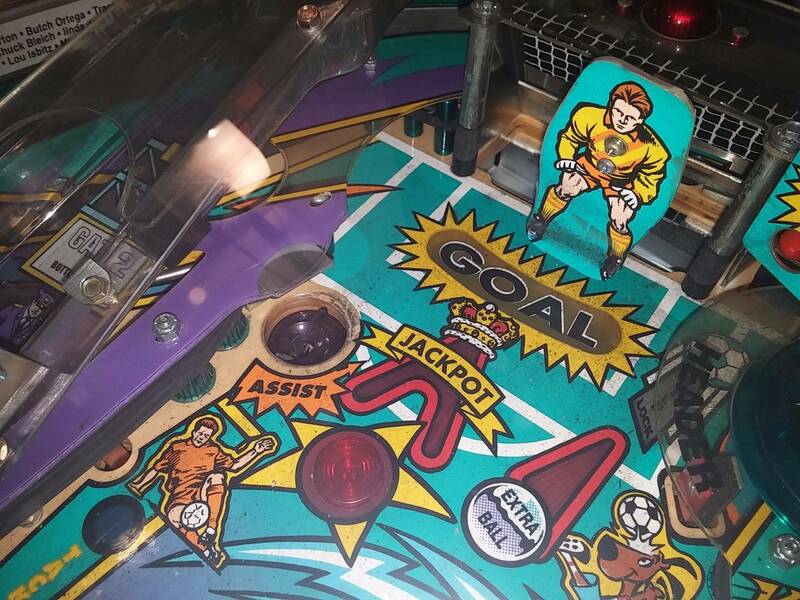 What are the metal blade type things in the picture near the coin box top? This will clean up real nice!!!! Cool score , those metal blades are dividers for the coin box. Those are dividers that fit in grooves in the cash box. Great score BTW. Only bummer is not opening it meant they didnt clean and wax ever but the hole wear is still better than normal and its always wonderful to open up a machine and its clean inside. I am stripping it down completely so shouldn't be a problem to install. Great find! I don't think there's any need for Cliffy's unless you plan on routing it. Can you educate me on the difference? Ya get cliffy's. Worth it. Or you could restore and clearcoat the field. Also worth it, i had a cc'd wcs and it played so fast and fun. I actually professionally restored vintage bicycles and have quite a bit of experience with painting. Mainly Acrylic Enamels for authenticity but also two stages (Base clear) when necessary. 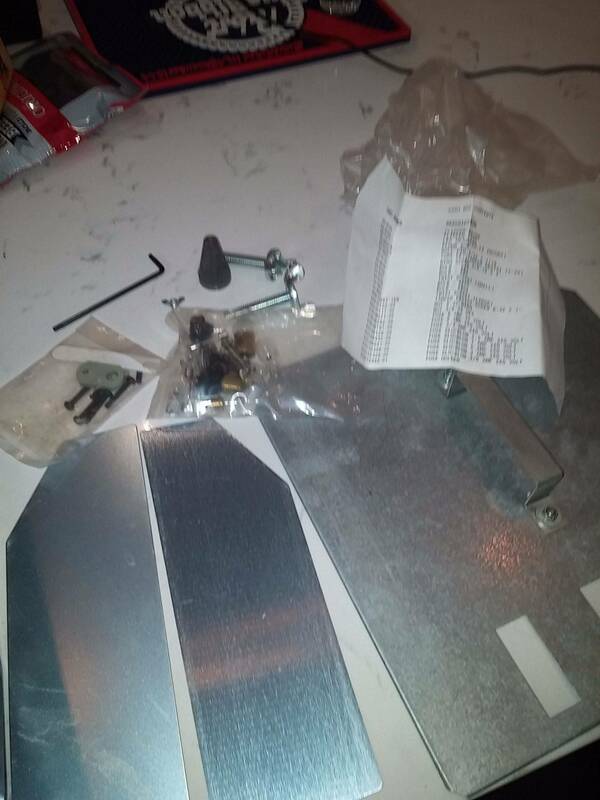 I have all the expensive Sata guns, etc. I am very tempted to use my 3m Finesse it II and 3M hand glaze. These are professional products that work wonders. 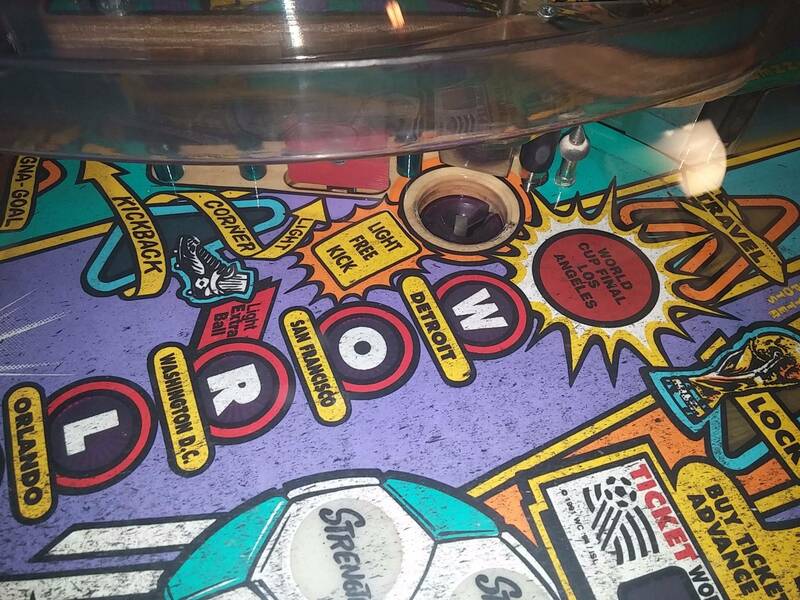 3 years ago I found an excellent WCS for my friend's 1st pinball game that was dirtier than yours and it cleaned up perfectly. 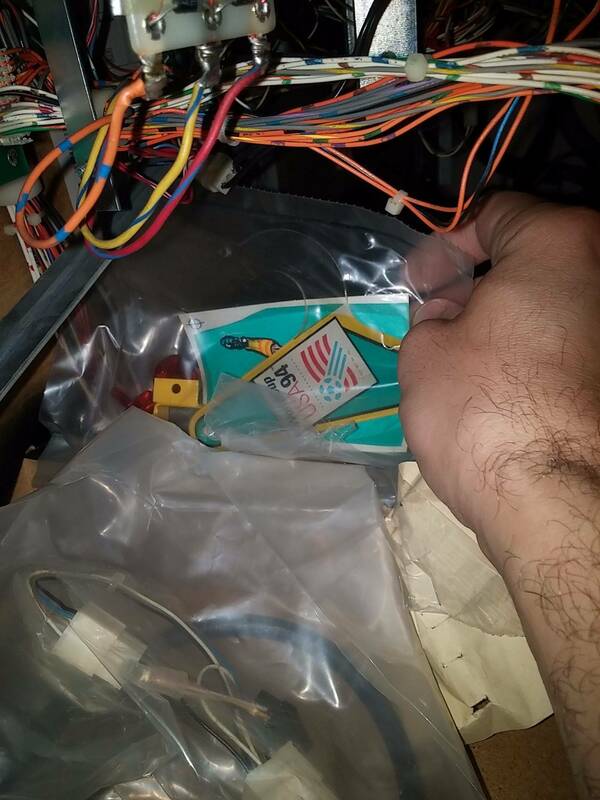 It also had the original batteries from the factory and my buddy couldn't believe they never leaked. All I had to do it shop it out, have one of the GI connectors replaced and reflowed new connector to board ,.....Perfect. Enjoy the game it's a lot of fun....well you should know you already have one! I too have a HUO WCS94. The game plays amazingly. Mine was completely shopped 2 years ago and barely shows any wear, and no dirt after a lot of plays. 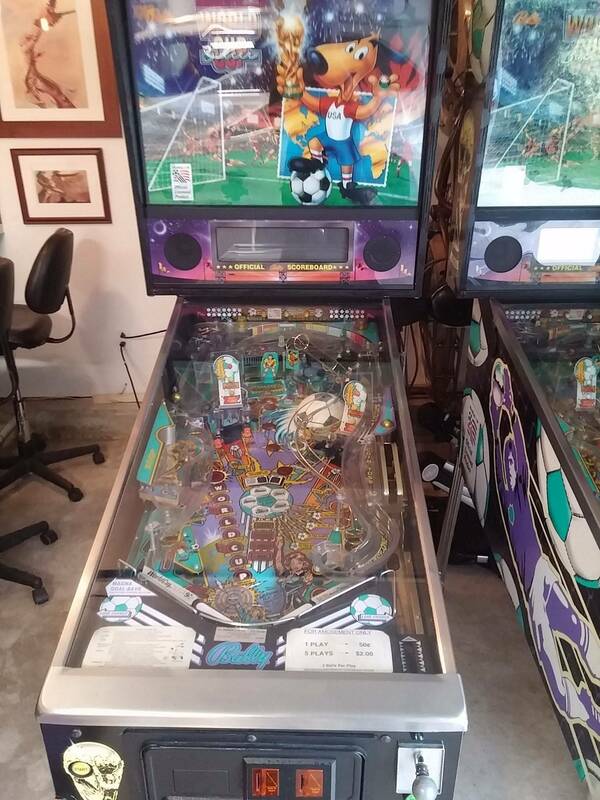 If I were you I wouldn't bother clearing the playfield. Just shop it, do cliffys, and enjoy I didn't even do LEDs and it's a bright beautiful game. It's not "just a WCS" it's a great fully featured game from the golden era of DMD games. Check out the WCS I scored out of a pawn shop of all places. Mint in every way. Damn, that thing is MINT! Looks pretty nice. Keep it away from windows / sun or the nice deep yellow on the cabinet will be faded quickly. I just sold a really nice one too. Fun game! 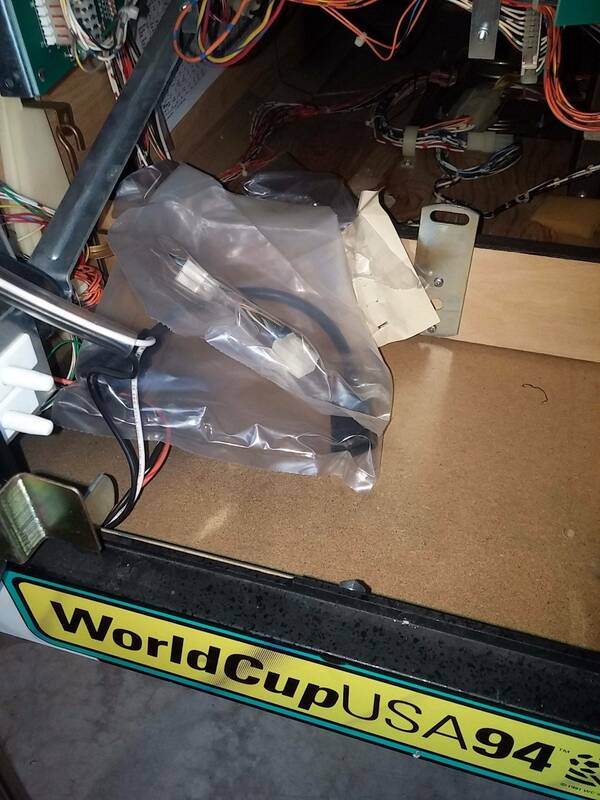 Well now we know that WCS shipped with black rubber. Great find! I am just not a big fan of Cliffy's for saucers unless you are trying to cover a very worn area. I think they are fine for scoops but just tend to draw too much attention on saucers. I think your game does not need them for home use. I have had a WCS for about 6 years with practically no saucer wear (about like yours) and have not seen any change. I actually bought 3 Mantis saucer protectors like he sells for TOTAN but have never installed them. Nice score!!! How is the gold on the legs and the wire ramp? I'm sure it varies from machine to machine and probably has alot to do with the wear at the saucer but I had one hell of a freaking time adjusting the assist after I installed a Cliffy on it. The shot wouldn't come out properly and would either hit the goalie or not have enough power to make it in the goal. I basically had to bend and tweak the mechanism for the assist saucer to work like it did before. 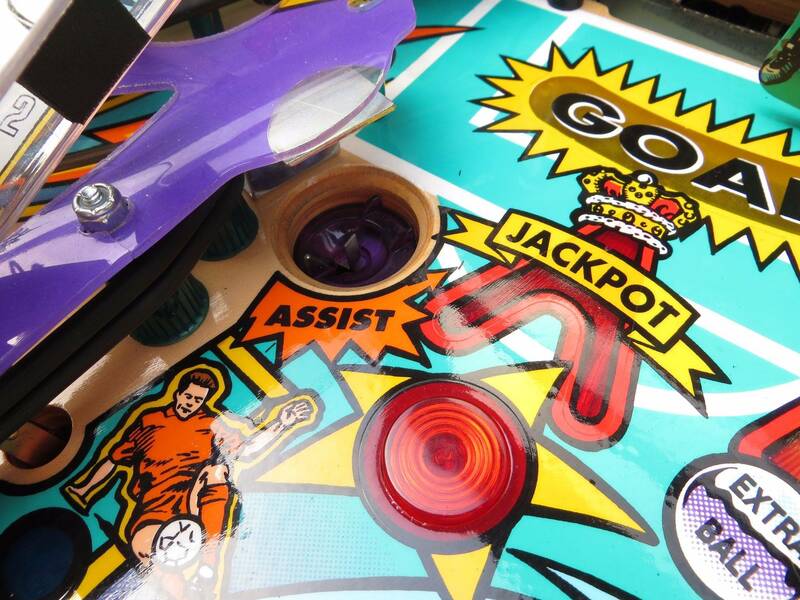 One thing that I also notice now is that the ball doesn't fall into the assist saucer like it used too. 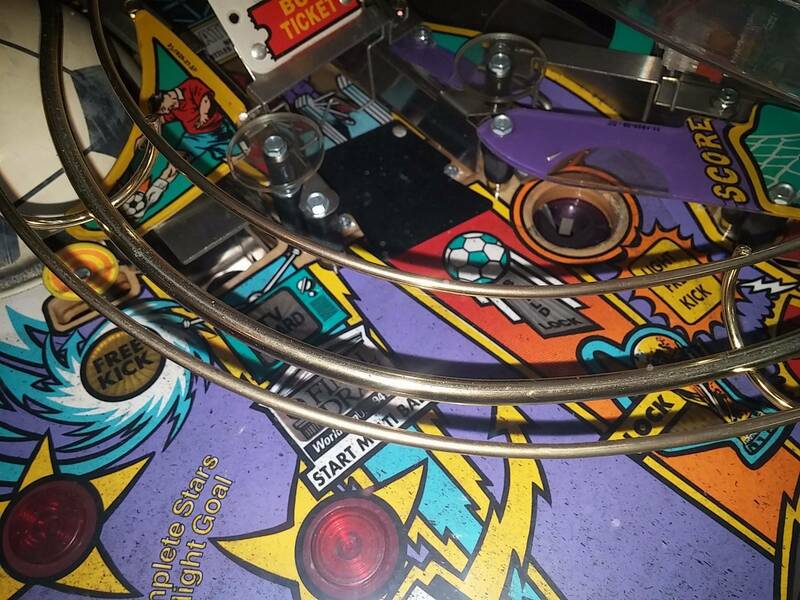 Since the protector is slightly above the playfield those slow rollers that used to drop in now roll off and come back at you. I will probably remove it at some point but I just left it for now... not really sure if I like the Cliffy's on that saucer because it does effect play to some extent. I think in your case they're just fine.. those saucers are pretty damn clean. Nice find! The gold on the legs is a little faded, but 90% there. I didn't look that closely at the ramp. Will check it out tonight. They are tough to find in great shape. Congrats.